Founded in 1951, Ecurie Ecosse (French for “Scottish racing team”) developed a special relationship with the Jaguar Cars Ltd. during the 1950’s. The team participated in the British Grand Prix three times fruitlessly until it came to possess Jaguar C-Types in 1954. 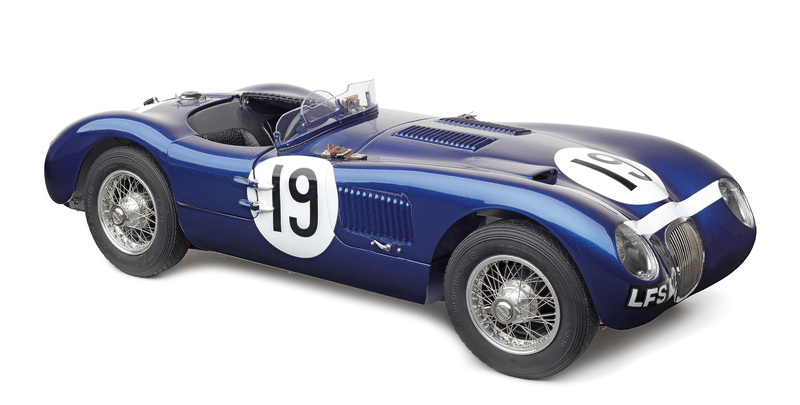 CMC has meticulously studied the metallic blue C-Type with start number 19 that raced at the 1954 Goodwood Members’ Meeting to clinch an impressive win for the Ecurie Ecosse. Ecurie Ecosse took over the triumphant C-Type fleet from Jaguar in April 1954. The Scottish team had the cars repainted in its racing colors – a “flag metallic blue” finish with white stripes across the front end. David Murray was happy with his newly-acquired C-Type Lightweight fleet throughout the 1954-1955 season — not only in races across the United Kingdom, but also at international motorsport events. Racing for his team were Ian Stewart, Bill Dobson and Sir James Scott Douglas. 1955 saw Jimmy Stewart and Ninian Sanderson replace Bill Dobson. Jimmy Stewart and Roy Salvadori alone contributed five victories, four second places, and four third places to the team record. In total, Ecurie Ecosse finished the season with a record high of eight victories. Jimmy Stewart’s C-Type Lightweight (XKC 052) with start number 19 was the winner of the Goodwood race on May 1, 1954, and it is replicated as the benchmark of Ecurie Ecosse’s victorious fleet during this period. Ecurie Ecosse sold its C-Type factory cars in October 1954 to garner the start-up capital for the purchase of the brand-new D-Type cars that Jaguar promised to supply in early 1955. XKC 052 was sold to Peter Blond, a British sports car pilot, who raced the car very successfully thereafter, winning a second place at Goodwood and a fourth place together with Hans Davids at Spa-Francorchamps, Belgium, among others. The car was present at Jaguar’s 1991 and 1993 cavalcades in Le Mans to celebrate the C-Type wins there in 1951 and 1953. The Jaguar C-Type has been one of the most sought-after historic racing cars in the last few decades. At Pebble Beach in August 2015, Chassis XKC 052 was sold by RM Sotheby’s for $ 13.2 million, which makes it the most expensive Jaguar to this day.